I’m all about making learning fun. If it’s fun and hands-on, it’s more likely to be remembered. But as with many things, it’s sometimes more easily said than done. I find that I can grab spontaneity by the horns at times, but other times it’s helpful to have a list of concrete ideas to put it into practice. I’ll start with ways to learn reading, writing, and math with stones, then move on to learning about geology and the natural world. I include some of our favorite books about rocks (Byrd Baylor! ), some DIY learning games and activities for preschoolers and older kids, as well as a couple of commercial (but unique) games for school age children. How about you? 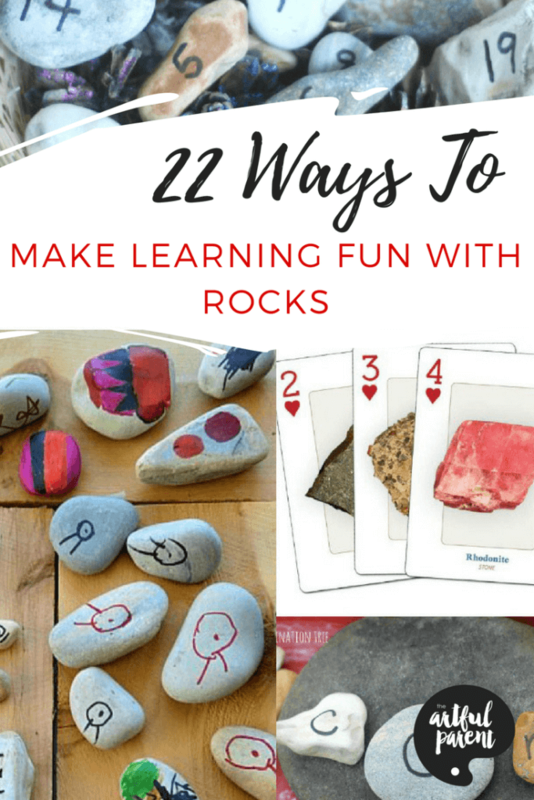 Will you try some of these ideas for making learning fun (with rocks!) this summer? What a great post, Jean. Thank you for including our constellation rocks! What a lovely resource for my rock-lovin’ kiddos! Thanks so much for including my color and shape rocks with the other wonderful ideas!! Rocks are just the best aren’t they, I use them heaps in my class too. We’ve made our own story rocks by using clear varnish to secure a photo of each little onto a rock, that way they can be part of the story. Also now that the littles are secure with the alphabet I’ve added the digraphs and constonant clusters as we go oo, sh, ch, ee etc. Great having all of these ideas in one place. I have a special needs child in my class who LOVES rocks — this would be the perfect resource for him. Thanks so much for sharing! Awesome website but I live in Downtown Houston where can I buy these big river rock?